VietNamNet Bridge – 2013 is a year worth remembering with the discovery of a series of transfer pricing cases in which foreign invested enterprises evaded the tax worth trillions of dong, and the presence of the big guy—Samsung, with the committed investment capital of $4 billion. By December 15, 2013, Vietnam had licensed 1,275 new projects with the total investment capital of $14.272 billion, an increase of 70.5 percent over the same period of 2012. It had also approved the additional investment capital of $7.355 billion for 472 operational projects. With the total newly registered investment capital of $21.628 billion, Vietnam has far exceeded the targeted level of $13-14 billion set earlier this year. Foreign investors have registered the investments in 18 business fields, of which the manufacturing sector attracted 605 projects with the capital of $16.636 billion, or 76.9 percent of the total registered capital. About $11.5 billion has been disbursed by the end of December 2013, an increase of 9.9 percent over 2012. This is really an encouraging result if noting that the disbursed capital in 2012 saw a 4.9 percent decrease in comparison with the year before. Some localities, which were never considered the attractive destinations for foreign investors, have unexpectedly attracted big investment projects. Thai Nguyen, for example, has arisen to top the list of the localities that most attract FDI. The newly registered and additional investment capital reaches $3.4 billion in 2013. Thanh Hoa province, where the Nghi Son oil refinery project is located, ranks the second after the oil refinery registered an additional investment capital of $2.8 billion. Meanwhile, HCM City, Binh Duong, Dong Nai and Hanoi, which are believed to be the most attractive land for foreign investors, rank behind the others because of the smaller scale of the projects. There have been 7 multi-billion dollar projects so far. These include the Nghi Son oil refinery project developed by Japanese investors and the $2.018 billion BOT Vinh Tan 1, a coal run thermopower plant invested by a Chinese group. 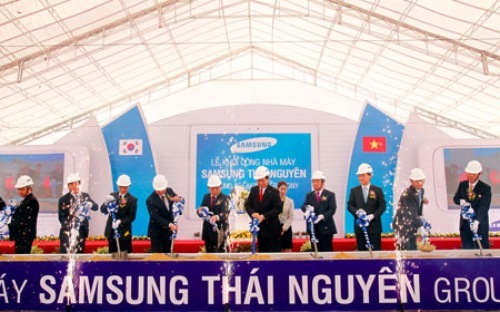 With the committed investment capital of over $4 billion in the two new projects in Bac Ninh and Thai Nguyen provinces, Samsung has become the biggest foreign investor in Vietnam. In the first quarter of 2013, the South Korean investor announced the $2 billion project on making and assembling electronics in Thai Nguyen. It is also running Samsung Electro-Mechanics Vietnam, capitalized at $1.23 billion and has increased the investment capital by $1 billion for the project in Bac Ninh province. In October 2013, the 8 million ton per annum Vung Ro oil refinery with the investment capital of $3.1 billion got the amended investment certificate. Also in October, the Nghi Son oil refinery project capitalized at $9 billion was kicked off. Meanwhile, Thai investor has announced the start of the Nhon Hoi oil refinery complex in Binh Dinh province. This is a mammoth project with the investment capital of $25-30 billion. A report by the Ministry of Finance showed that about 50 percent foreign invested enterprises declared a loss, a lot of which reported the loss for the last 3 consecutive years. The enterprises. which reportedly report losses for the last many years but still have been expanding their business, would be the “aiming points” of taxation officers who try to discover the transfer pricing cases.